Playing with Paper: Happy for you! Hello there! I left work on time today for the first time in ages (it's been crazy busy lately so I have been working lots of extra hours) so that I could have a bit of a potter in my garden while there were still remnants of daylight left, and also, so that I could complete the following card I made for this week's CAS-ual challenge which is to use an embossing technique. I made the flower panel last night before I went to bed by clear embossing on watercolour card the biggest flower from the "Petals from Scratch" set by Fiskars (I know I keep using this set, but I love it!) which I stamped with Versamark ink. I then used a drop of Spun Sugar Distress Ink reinker on an acrylic block with a little bit of water to colour the petals. For the flower centers I used Soft Peach shadow ink on the acrylic block with no water added. This afternoon I created the tag using one of the sentiments from the above set clear embossed on the same watercolour card and coloured it with Spun Sugar and water. I punched out the tag with an old Carl tag punch and tied it on to the ribbon using white cotton string. The ribbon is from Kaisercraft and the button is from a cheap pack I bought from a discount shop. So soft and pretty! Gorgeous embossing! Beautiful, sweet and soft! 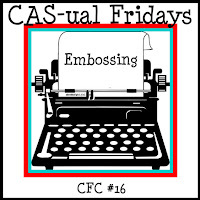 Thanks for playing at CAS-ual Fridays this week. Sweet and soft and elegant :) Glad you played with us at CAS-ual Fridays! GORGEOUS! I can't stop looking at this beautiful card. Thank you for joining us this week at CAS-ual Fridays!